(York, Pa., Jan. 2, 2018) - The York Revolution announced today the team has completed the trade that brought slugger Rubi Silva to York late last season. 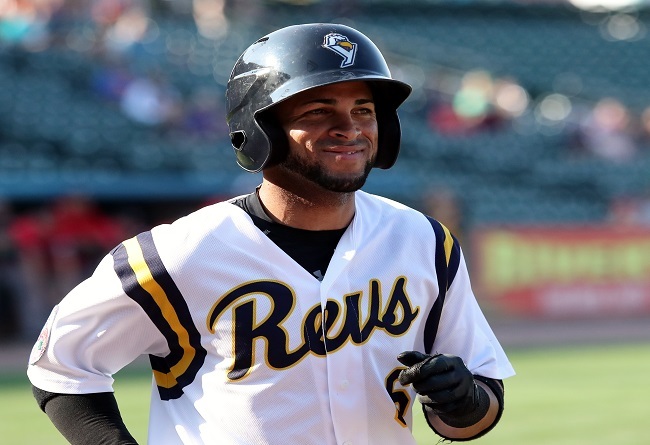 The Atlantic League champions traded infielder Chase Simpson to the Can-Am League’s Sussex County Miners to finish the deal for Silva that filled an injury-prompted hole on the Revs roster in 2017. Silva was acquired by York for the final week of the regular season and made an immediate impact. Inserted into his first game on September 11, the day he was acquired due to injury to another player, Silva cracked a game-tying home run on the first pitch he saw in a Revolution uniform, helping lift York to a 2-1 win over Long Island as the Revs moved toward clinching a second-half division title. Silva batted .379 (11-for-29) with four RBI in seven regular season games and was the Revs' everyday second baseman and number three hitter during the team's playoff run en route to the Atlantic League championship. Silva batted .452 (14-for-31) in seven playoff games and led all playoff hitters with a Revs playoff-record seven runs, 14 hits, 19 total bases, three doubles, one triple, and four extra-base hits. He notched five multi-hit games during the postseason, including a 4-for-4 performance in the championship clincher, punctuated by an eighth inning leadoff bunt single that set up Telvin Nash's championship-winning two-run home run. After beginning his career in his native Cuba, Silva joined the Chicago Cubs organization, reaching Triple-A Iowa, where he batted .282 with 11 home runs during the 2015 season. The 28-year-old spent five years in the Cubs system, posting a career .282 average, including a strong 2013 campaign at Double-A Tennessee, where he batted .284 with a career-high 15 home runs. Simpson batted .199 with six home runs and 22 RBI in 57 regular season games as the Revs' third baseman. He went on to hit .346 with a home run and four RBI in seven postseason games. Simpson's biggest highlight came in the regular season's penultimate game on September 16, when he crushed a seventh inning grand slam to help cement a 13-7 victory over Lancaster and a second-half division crown. It was one of four home runs hit by Simpson over the season's final eight games. Simpson spent each of his first four career seasons in the Pittsburgh Pirates organization, reaching Double-A Altoona last year. The Revolution begin their defense of their Atlantic League championship against the Lancaster Barnstormers on April 26 at PeoplesBank Park. For more information, visit www.yorkrevolution.com.